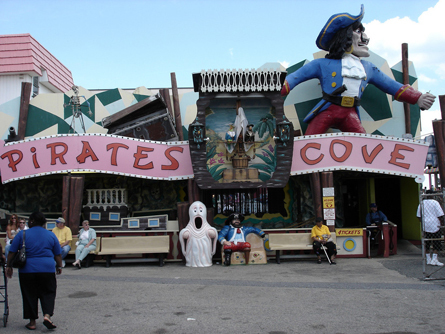 The Pirates Cove, which resides as an attraction owned by Trimper Rides, was built around 1971. Granville Trimper commissioned Bill Tracy to begin work on this attraction after he decided it was time to add a funhouse to his growing collection of rides. The Trimper’s built a concrete facility to house this attraction on the backside of the park near its entrance. Tracy did not miss a trick in this old fashioned funhouse. The lobby area is full of floor obstacles like a draw bridge and moving ship deck. Inside, you will encounter Tracy’s forced-perspective hallways, spinning tunnels, drunken pirates and even a mirror maze with strobe light. And, you can't miss the façade which towers over the rest of the park with Tracy’s Pirate and treasure chest. 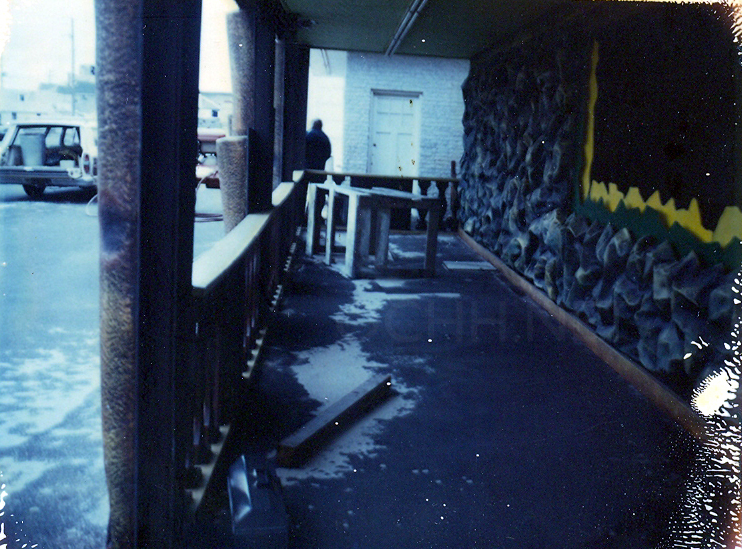 Trimper added the diorama with talking parrots to the façade in the late 80s-early 90’s. The side of the building, although exposed to the public, is covered with fiberglass stone panels and the distinct heads of skeleton pirates. And, be sure not to miss the crew member in the crows nest which can be seen at the park’s entrance about 30 feet up. In 2006, the Trimper’s started to repaint the façade sign and background. It is important to note that nothing has been deleted from this original Tracy attraction. Over the years, the Trimper’s have added a few dioramas and minor effects and lighting, but it still remains one of the most complete Tracy funhouses left in America. 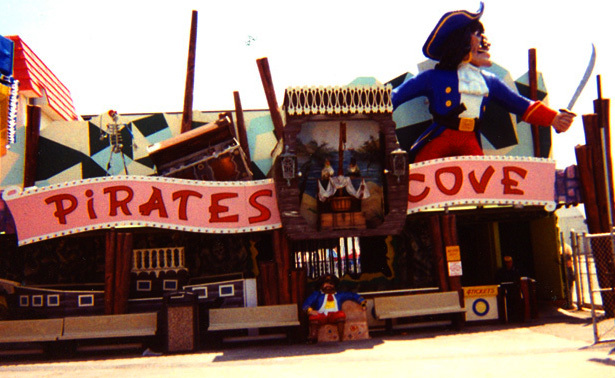 The Pirates Cove as it looked in 1971 before construction was complete on the facade. 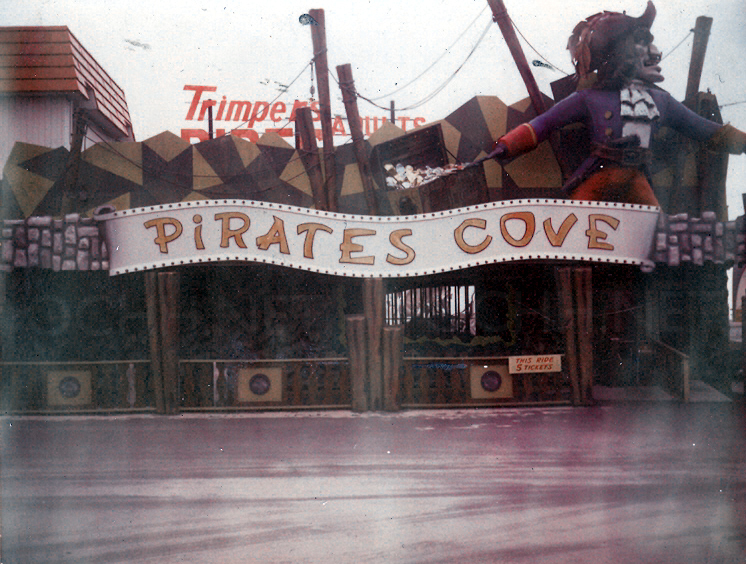 The Pirates Cove as it looked in winter 1971 before construction was complete in the lobby. 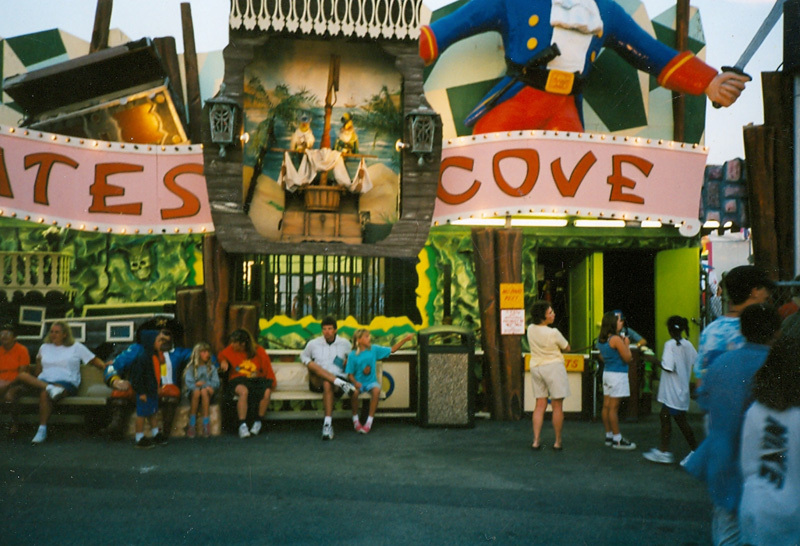 The Pirates Cove as it looked in the late 1980's. 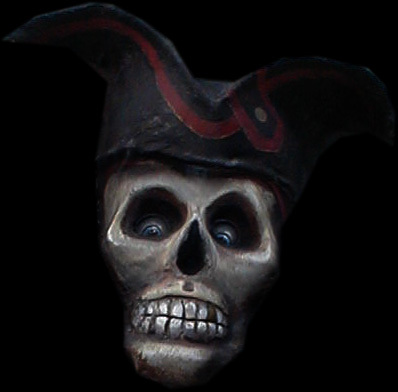 (notlmpresed)- Inside the Pirates Cove - a great POV tour of inside the attraction. (MBrilhart)- Pirates Cove Complete- A very complete tour of the interior of Pirates Cove from summer 2009.